Circa 1892 Mr. George D. Warthen had the wooden building at 129 West Haynes Street, across from the Courthouse, torn down to build a brick building that would become his living quarters. George D. Warthen, a well known businessman, was one of the original partners who founded the Geo. D. Warthen Bank. The bank was originally located next door where Karol’s of Sandersville would later do business for over 40 years. The building is now the home of the Hair Force. Mr. Warthen’s living quarters was the location where Geo.’s Quarters started business in 2004. The building was a beautiful display of a historic residence utilized by a gift shop. The building’s beautiful original wood doors inspired awe in passers-by and opened to reveal gorgeous refinished wood floors and sunburst stained glass interior doors reclaimed from a hotel in Savannah, Georgia. This building was a great place to start a business as it gave the customer a different shopping experience in a small town. Geo.’s Quarters was established in 2004 by Lisa and Carl McDonald (the owners of North Pointe Pharmacy & Gifts at the time), and managed by Lisa’s brother, Joey Giddens (current owner/manager). Lisa & Carl decided to expand their gift selections from North Pointe into a wide selection of home décor, gifts, antique furniture, and gift items for an extensive bridal registry. 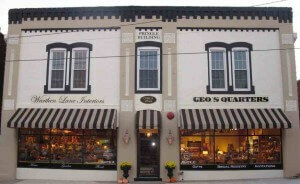 In October 2006 Geo.’s Quarters was sold to Joey, and his brother, Tracy, and Tracy’s wife, Cindy. When the store changed hands, we added three more wonderfully displayed rooms. One room was a small gift area, the second was an everyday selection for bridal registry, and the third was a seasonal room displaying Christmas Items. On October 1, 2012 we moved down the street to our new home located at 114 East Haynes Street in “The Pringle Building”. The Pringle Building was built by Mr. Coleman Robert Pringle circa 1890. Our new location is a great fit for our growing business. Our open sales floor plan expanded our displays and made it easier for our customers to shop. The new location is in a historical building and still offers the feel of well-loved shops in towns such as Charleston and Savannah. The Pringle Building is on East Haynes Street which was once known as Cotton Avenue, when cotton was king and traded in the area during the 1920’s – 1940’s. We are excited to bring our gift shop to the world wide web through www.gqgifts.com and social media such as Facebook, Twitter, Instagram, Pinterest, and LinkedIn. We are now able to offer our wonderful selection of gifts for all to enjoy. Our store hours are Monday thru Friday 9 a.m. until 6 p.m. and Saturday 9 a.m. until 2 p.m. We are open on Saturdays during December from 9 a.m. until 6 p.m. We are uniquely located in the heart of Georgia, just off Highway 15. We are only an hour and a half from Athens and two hours from Savannah. It is also only a one hour drive from Macon and Augusta. We are just a short drive of 30 minutes from Milledgeville and Dublin. For those of you that fly into Atlanta, it is only a two hour drive to get here (take I-20 East to Hwy 15 South). Sandersville is also located on the Sherman’s March to the Sea Trail. Take a day and come spend it with us and our other wonderful antique & gift shops and good ol’ country cooking in downtown Sandersville, Georgia.